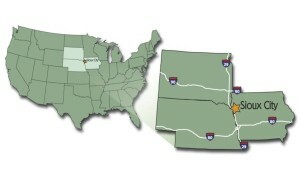 With their capitol cities in Des Moines, Pierre, and Lincoln, respectively, the states of Iowa, South Dakota and Nebraska come together physically in Siouxland. Siouxland is also a place where they “come together” to form a tri-state region built on the spirit of innovation and cooperation. 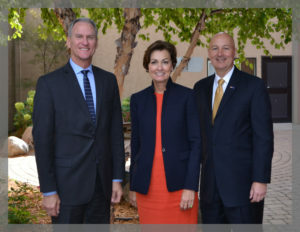 (L-R) South Dakota Governor Dennis Daugaard, Iowa Governor Kim Reynolds and Nebraska Governor Pete Ricketts at the 2017 Tri-State Governors’ Conference. The governors of these three states meet in Siouxland with local government, business and civic leaders to work jointly on the development of the area. While this type of tri-state cooperation might be considered unique in other parts of the country, it is the standard in Siouxland. 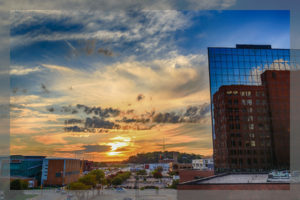 Working together has allowed us to grow together, and allows businesses and individuals a unique opportunity to enjoy a variety of options for housing, business location, and recreations.